Boasting a prime riverside location and five-star reputation, the Marriott Hotel is positioned as one of the most exclusive venues to host an event in Brisbane’s CBD. With flexible packages to suit everything from small soirees to receptions up to 230 guests, the Marriott will ensure your function is one to remember. Recently updated with a $20 million refurbishment, the Marriott’s ten event spaces get a 10/10 from the G&G. From intimate cocktail gatherings to large, seated dinners, each room can be modified with furniture and technology configurations, seasonal and festive decorations, and enticing catering options. It’s beginning to taste a lot like Christmas – with end-of-year party catering including a casual, classic Aussie barbecue on M Deck (the Marriott’s gorgeous outdoor space), or a traditional three-course dinner complete with bon bons and Christmas tree! Dressed to impress, Marriott’s Fraser Room, Atcherley Room, Makore Boardroom or Executive Boardroom are ideal for business functions and meetings. For large celebrations like weddings and formals, the opulent Grand Ballroom and Queen Adelaide Room offfer plenty of space left to dance the night away! 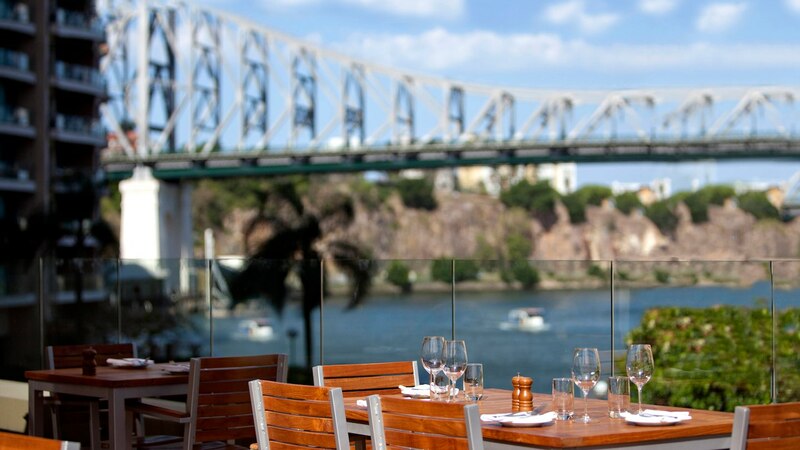 The floor-to-ceiling windows with views of the Brisbane River, Story Bridge, and Kangaroo Point Cliffs make for a striking backdrop that attendees are sure to be wowed by. In-house catering options are versatile and can meet both budgetary and dietary needs; from hot and cold canapés, to business lunch buffets and seated dinners, every form of function catering can be delivered in the Marriott’s signature decadent style.